Union Pacific engine 3985 is the world's largest operating steam locomotive. 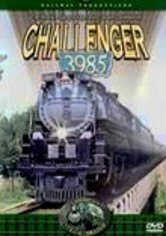 Built in 1943 and promptly nicknamed Challenger, this engine blows its stack on an epic trek through Wyoming, Nebraska, Iowa, Missouri, Illinois, Oklahoma and Texas. Visit the Cheyenne Steam Shop where Challenger is maintained using the roundhouse's historic equipment, then climb aboard 3985 and ride the rails on excursions and convention trips throughout the Midwest.